Ask The Protein Powder Chef: Do You Have A Recipe For Protein Pancakes? Drop that frozen waffle. Slice through this delicious carb-and-protein-filled breakfast that's sure to kick off your day the smart way. Hi Protein Chef! I love a warm breakfast, but I'm sick of oatmeal. Do you have a recipe for a delicious, nutritious meal that packs a protein punch? Move over oatmeal. Now that it's winter and the temperature is dropping, what better way to start your day than with a big, steaming stack of freshly made protein pancakes? They're fluffy, delicious, and sure to hit the spot. I made these using cinnamon roll protein powder and coconut flakes. It might sound like an unusual combination, but it works! 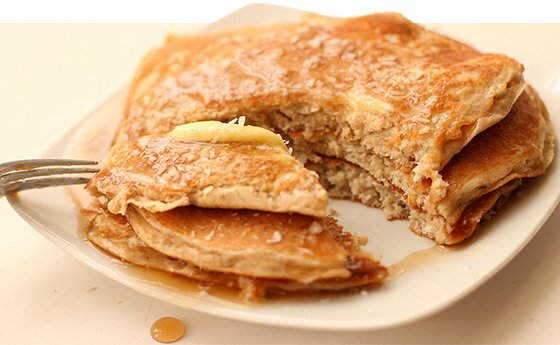 The coconut adds an extra element of crunch to the pancakes while complementing the cinnamon roll flavor perfectly. Well, at least I think so. If my predictions are correct, you're likely to feel the same. Not a fan of coconut? Substitute it with some flaxseed. For extra body, I added pea protein to the mix. If you don't have it, feel free to substitute with casein. So bust out that skillet, grab your ingredients, roll up your sleeves, and dive in!